An exhibition game Thursday night in Beijing between the Georgetown men’s basketball team and China’s Bayi Rockets ended in a violent brawl. Players exchanged blows and chairs were thrown, as what was supposed to be part of a goodwill tour for the Hoyas turned to utter chaos. 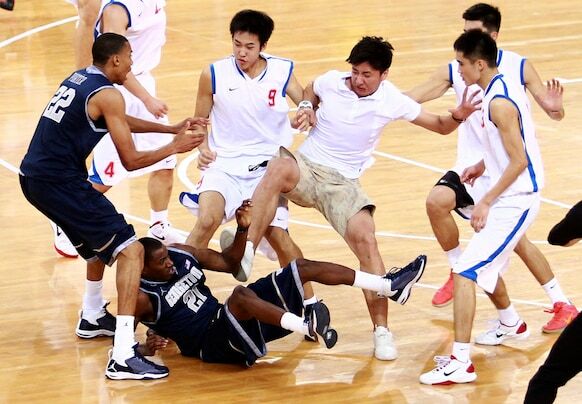 The melee commenced after Georgetown’s Jason Clark took exception to a hard foul on him by a Chinese player. When the bedlam died down, Georgetown coach John Thompson III escorted his players off the court with the game still tied at 64 and with just over nine minutes left in the contest. It wasn’t the first time benches cleared in game, which was already very physical and abundant in fouls called. To see video of the brawl, check it out here. If I had to decide who won the fight, I’d have to admit that it looks like the Hoyas got their asses beat. Can’t wait to hear those crazy Tea Partiers use this dust-up to blame Obama for allowing China advance past us in brawling skills. This entry was posted in News and tagged college basketball, georgetown hoyas. Bookmark the permalink.